I registered for the Florida Literacy Conference on a whim. My rationale went something like this, “Adult and Family Literacy certainly applies to SensAbleLearning, LLC, I’ll go.” It was a very good whim I followed. Souns® is a hands-on phonemic awareness program inspired by the Montessori Method. Letter sounds are taught before letter names. It’s a simple switch with brilliant results. Brenda Erickson, founder of Counterpane Montessori and creator of Souns® , designed it for ages 0-3, but I have used it as intervention with children in high school and Brenda has used Souns® with adult refugees. (I learned Souns® for my two children, then ages 3 and 4, now 4 and 5. They learned to read so naturally using Souns®, I had the thought, “So many kids need this.” And SensAble Learning, LLC was born. At the conference, I had my first experience using Souns® with an adult learner. He inquisitively looked at the Souns® symbols (letters) and I explained quickly how the program worked the first time he happened by. I realized quickly that his curiosity was more than piqued as he touched the letters and said the sounds with me. I wondered if he could read, but I did not ask. He left to attend a workshop but he soon returned and apologized for having to leave. I asked if he would like to sit and work with me for a bit using Souns®. He said yes. We went through each letter sound, just as the program suggests. Most of the sounds he learned very quickly. I have the tracking sheet we used. He did not recognize many of the letter sounds initially, but we practiced and he learned. Next, I began building words with him using Souns® symbols and the objects I have ready in my box of three letter words. With each new word he built, a smile stretched from ear to ear displaying his delight in what I can only assume is a new understanding of this mysterious language code. I wish I had more time with this young man. I loved every ah-ha moment that came across the faces of trained professionals, tutors and scholars as they “got” how teaching sounds first before letter names removes much of the confusion not needed for a beginning reader. But, the ah-ha that will remain in my heart is the one I saw in the smile of the curious young man. I am a traditionally trained teacher who chose to put my career and doctoral work on hold to stay at home and raise children. 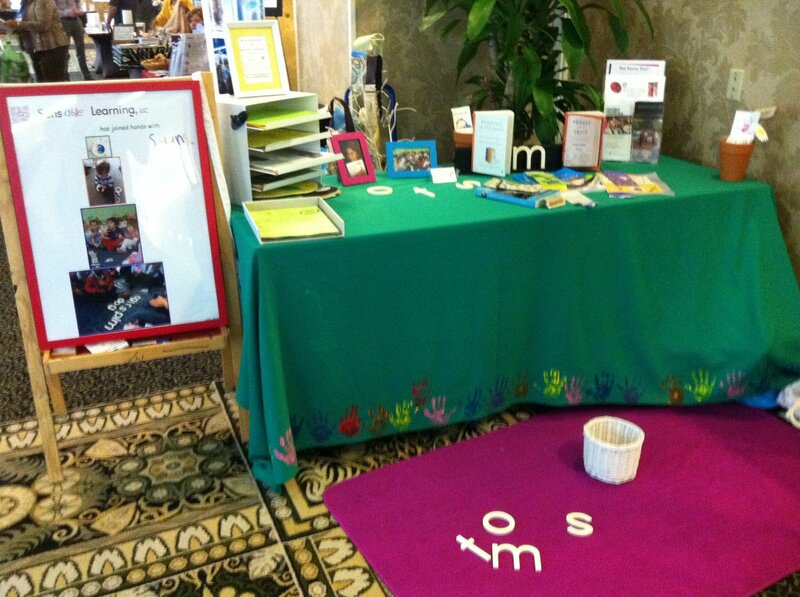 Last year, I met Brenda Erickson, founder of Counterpane Montessori and the creator of Souns® . The trajectory of my life has changed as we have joined hands to make sure kids will read, and read well. I tell her she will be the bridge from Montessori to mainstream. She tells me, Souns® will be the bridge from Montessori to mainstream. 2012 Conference Recap + Session Handouts! The 2012 might have been our best conference yet! Record attendance, inspiring keynotes, resourceful exhibitors, interesting session choices, a beautiful location and of course, wonderful attendees. Some top moments included Mawi…everything, adult learners reading their essays from the 2012 Essay book, State Literacy Awards Winners and watching part of Sarah Entine’s film, Read Me Differently. We also had a lovely photographer, Ashleigh Marie, who took several wonderful photos of the event. They’ll be uploaded to our Flickr account very soon, but in the mean time, check out this sneak peek on our facebook! There were several great presentations! Here are handouts from a few who have already sent me them. This list will be updated as more presenters email me their handouts. So if you presented at this past conference, share your wealth of information with other literacy enthusiasts! PBS-So much more than Sesame Street! Florida TechNet to Stream Live from the Florida Literacy Conference! Florida TechNet is proud to announce live streaming from this year’s Florida Literacy Conference. The five session presenters listed below have agreed to stream their presentation for those who are unable to attend the conference. Please refer to the list below for dates and times. Streaming will be done through an Elluminate Webinar session. The link will be the same for all sessions. The Opening General Session is only ONE WEEK away! Can you smell the Tampa Bay water yet?? One of our final posts before workshops start is to go over social media. We will be blogging during conference and giving recaps of great sessions and events. If you were at a session and had an amazing experience, let us know! We can set it up so you can blog during your breaks at one of the computer stations donated by Florida TechNet. You also can reflect on the experience as a whole and submit something after you’re back home. Either way, we’d love to hear about your experiences. We’ll also have a text/twitter updates going on. If you text “Follow FlaLitCon2012” to 40404, you can get text message updates on room changes, silent auction updates, and session reminders. If you plan on checking twitter frequently, follow us at @FlaLitCon2012. For those who love tweeting great ideas! Be sure to include #flalitcon so those not at the conference can follow the conversation. Don’t forget to check out our Conference Pinterest to stay updated on all the hotspots and happenings! 8:01 a.m.: A young man approaches your clinic window in silence, bending and flexing his fingers while looking you straight in the eye. 8:02 a.m.: The young woman standing behind him moans: Mijn hoofd doet pijn. You’ve got a long day ahead of you! “Say What?” is an interactive presentation that challenges participants to bridge the communication gaps that impact health literacy, especially due to education, language, culture and sensory challenges. Health literacy is the ability to obtain, understand and use basic health concepts, information and services in functional ways that enhance health. Presenter Chris Tittel takes health literacy into consideration every day in his role as public information officer and marketing director for the Monroe County Health Department. Health literacy is key to effective public relations and marketing, especially when researching, drafting and editing press releases, communicating one-on-one with members of the media and the general public and knowing where to refer anyone in need of particular services. “Say What?” also offers tips and tools that can help anyone working in the health care setting communicate more effectively with the general public, clients and each other. As a Florida adult educator, how open are you to using data and applying research? Research can apply to tutoring adults, counseling an adult learner, or making administrative decisions. If you like hearing stories, as told by numbers and adults, Open Minds may open your mind to applying the latest research. On May 10, join Dr. Margaret Patterson, Senior Researcher with Research Allies for Lifelong Learning (R-Ally), for this 3:45 session. 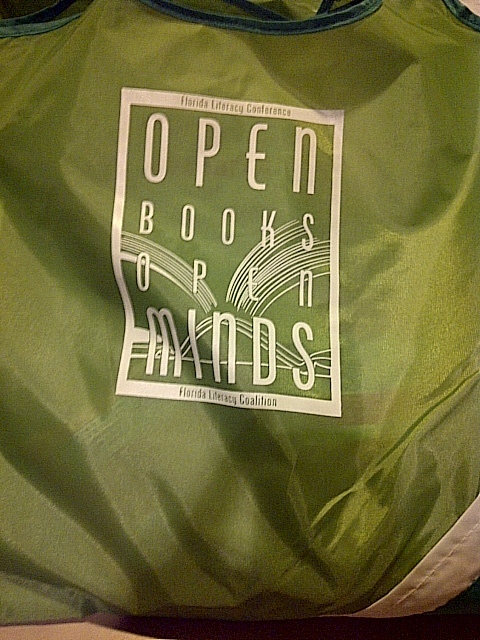 Open Minds will discuss applying research on adult learner outcomes conducted in 2011 and 2012. Are you open to looking at numbers? In 2012 R-AllyTM looked at outcomes data for adult education programs. * Data were from 2006-07 to 2010-11, the most current years available. Adult learners may have goals beyond learning English or basic skills. These goals might include getting or keeping a job. They may want to take the GED® test or go to college. If they meet a goal, they have made an outcome. Data on outcomes will reveal how outcomes change across time, both nationally and in Florida. Are you open to hearing the rest of the story, beyond the numbers? In 2011 Dr. Patterson (with a team of researchers**) travelled to 7 different states to interview adult learners. The research team interviewed adults with GED credentials on their educational experiences from youth through adulthood. These interviewees included high school dropouts, immigrants, homeschoolers, and even 12th-grade completers. They didn’t hold back in sharing their stories. The outcomes they gained from their time in adult education may surprise you. This session will also consider their recommendations to adult educators. Find out what they suggested to make learning even better for future adult learners. *The data source was U.S. Department of Education National Reporting System data. ** This study was originally funded by American Council on Education / GED® Testing Service. Literacy Awards Banquet, have you bought your ticket? The Florida Literacy Awards Banquet is on Thursday, May 10 from 6:30-8:30. It is our opportunity to highlight the many accomplishments in literacy over the past year. Awards will be given to adult learners, literacy practitioners, literacy programs, volunteers, and business partners. Dr. Gary Mormino from University of South Florida will be the keynote speaker. It promises to be a very exciting and inspiring evening. I often find myself watching the Food Network and seeing all of these amazing places. I’ll put the restaurant in a memo in my phone (an “in case you find your self in (insert area)” list) and often forget about it completely. THIS TIME I thought ahead for both of us. St. Pete has three restaurants, close to our hotel, that have been on various Food Network shows! Not only will you be able to go home and say you spent a week at a beautiful location, learned new strategies for working with adult learners, and met great people, you can also add that you ate at a restaurant that was on Diners, Drive-ins and Dives!